21.42. That’s how many pounds of propane I’ve burned in the last year or so. I know because I’ve kept every single one of the 1.02lb propane canisters I’ve used. I’ve thought about switching to the bigger 20lb tanks, to save money and reduce waste, but the one thing I like about the little canisters is that it helps me internalize how much gas I’m burning. Internalizing quantities is something we have a hard time with, yet, if we are to have any hopes of reducing emissions, it’s something we’re going to have to get better at. Unfortunately, in modern society, most of our energy consumption is abstracted away from us. When you pump gas into a car, all you see is a number on the screen, and you probably don’t even know how big, physically, your gas tank is. At home, the power and gas meters are conveniently hidden away. So, understandably, it’s difficult for us to even realize how much energy we’re using even in an abstract sense, much less in any tangible way. I remember one time while I was pumping gas, I tried to visualize the quantity of that volatile liquid I was going to burn, by picturing all the gas being in 1 gallon milk jugs. Then, I pictured 12 of those jugs and imagined lighting it all on fire. In my mind’s eye I saw a giant ball of flame, and thought for a second that blowing up 12 gallons of gasoline might actually be more fun than using it to drive about 300 miles. A rechargeable AA battery, at 1.2V, might contain about 1.5 Amp-hours, or a theoretical 3.3 Watt-hours of power. In practice, the voltage would drop too low to be usable after a while, so let’s say, generously, that you’d get 2 Watt-hours. An “efficient” CFL bulb might use 13 Watts, so if you left it on, you’d be using enough energy to drain more than 6 rechargeable AA batteries every hour. Fortunately, if you live in the city, all that power gets delivered to you with the flick of a switch. But next time you do, pretend you’re draining an AA battery every 10 minutes, and it might help you remember to turn lights off when you don’t need them. In any case, I’m trying to reduce propane usage on my property. Right now, I use propane for my cooking stove (at a rate of about 1lb per week), and my lamp, which also doubles as a heater (which burns about 2lb a week). So far, I’ve had two separate offers from readers to buy me a propane shower, but I’ve resisted. 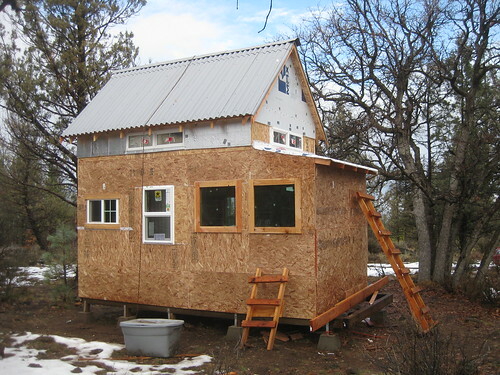 Once Hut 2.1 is done, I’d like to switch to electrical lighting (charged by solar, and perhaps also wind), burn wood for heating and some cooking, and only use propane for the kind of cooking that can’t be done on my wood stove. Some people argue that wood stoves aren’t so “green.” Burning wood can be rather dirty, especially in old stoves that are inefficient and don’t have catalytic converters. This is true. But, I don’t think it’s realistic to treat all wood burning equally. 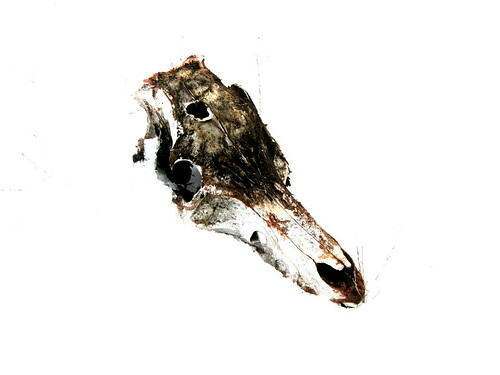 First of all, when you burn fossil fuels (which include “natural” gas and propane, as well as coal), you’re burning carbon that was taken out of the atmosphere millions of years ago, and then re-releasing it into the atmosphere now, when, if left in the ground, it may not have been re-released anytime soon. When you burn wood, you’re releasing carbon that was absorbed in the last hundred years or so. And –here’s the important part– around here, if I don’t burn the dry tinder, it would eventually be burning anyway in the not-too-distant future. This isn’t true everywhere. As far as I know, forest fires aren’t part of the natural ecosystem in rain forests, and so felling and burning those trees artificially adds emissions. But, around here, it is almost a guarantee that, if left to nature, any patch of forest would burn once every hundred years or so. So, when I pick up some dead dried branches from the woods around me and burn it, I am releasing the carbon trapped in it the way it would’ve anyway. Granted, some of it may have eventually rotted away, or otherwise have gotten broken down biologically (via termites, and other organisms), so I may be boosting emissions slightly, but not by much. On the other hand, if I can clear the forest and minimize the risk of uncontrolled natural forest fires, I may help reduce emissions that way, thus balancing my footprint (though, perhaps not, because the way to clear forests is to –surprise surprise!– do controlled burns). Of course, CO2 is CO2, regardless of whether it comes from burning wood or burning propane. So, arguably, the two may be considered to be comparable. The difference, though, is that propane is so much more convenient, and so much denser in energy, that it’s much easier to burn in excess when compared to wood, which, by virtue of being less energy dense than propane, takes more effort to move, even if you don’t do the chopping and splitting yourself. 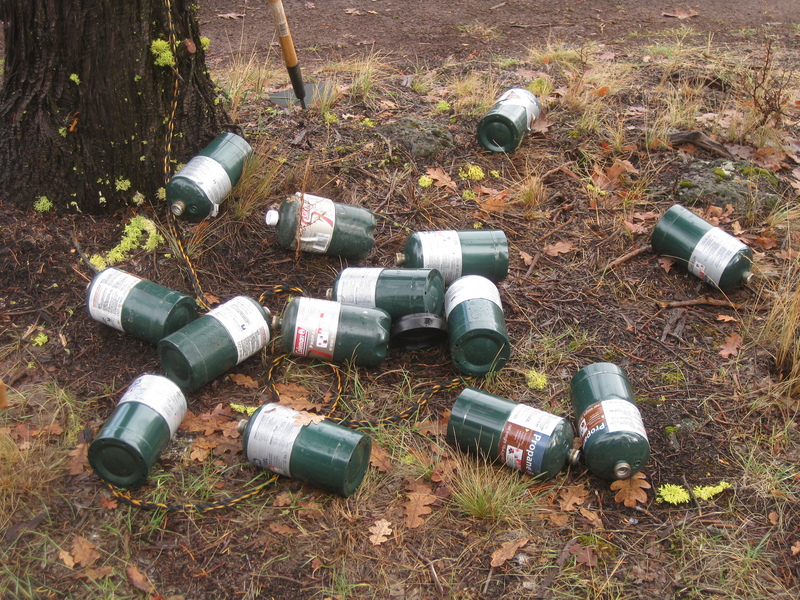 A 20lb canister of propane contains roughly the same amount of energy as 60 to 80lb of seasoned firewood. But which would you rather move? Which would you be more willing to go buy more of? When less is more (or better), taking the less convenient route can allow us to be more conscious of our consumption habits, and in turn, moderate such behaviors. If I rely on wood for heat, I’ll need to exert more effort into gathering fuel than if I burned propane. So, I’ll naturally want to burn less of it, and therefore reduce my overall emissions. Moral to the story? Convenience has a cost, usually in financial terms, but also in environmental terms and even health. Cooking your own meals might be less convenient than eating out, but may be cheaper and healthier. Walking or biking to work may be less convenient than driving, but will be cheaper, healthier, and more environmentally healthy. In typical modern lifestyles, it’s not difficult to find ways to do good, by enduring –nay, by enjoying— just a little bit of inconvenience. So, next time you have a chance to chose inconvenience over convenience, give inconvenience a shot. Your wallet, your body, and your environment will thank you for it. I posted some thoughts on insulation a while back, but now that I’m actually in the process of insulating Hut 2.1, I figured I’d do another post talking about what I’ve ended up doing. Putting insulation on the outside leaves the wall cavities available for use. I’ve filled in some of the walls with “shelves”, but I also have the option of filling them in with batt insulation if the rigid boards on the outside prove to be insufficient. The same applies for the space between my rafters, which I may fill with batt insulation later. Instead of using a traditional air barrier, I’m taping the seams between the insulation panels together so that the insulation panels themselves form an air barrier. The boards on the roof also act as a waterproof layer, in the event that moisture leaks through the roofing panels. This cuts down on building materials, which lowers the financial cost as well as the total environmental footprint. By wrapping the entire structure in insulation, I am increasing the thermal mass within the thermal envelope. That is, all the posts and beams and OSB sheathing inside the insulation act as a thermal mass, which can absorb heat and release it slowly. Obviously, wood isn’t as effective of a thermal mass as, say, a concrete slab, but I think it counts for something. The downside is that, if I’m heating the structure from a dead cold, it takes longer to warm up, because, for a while, the structure itself is going to be absorbing some of that heat. Covering every square inch of the exterior in insulation (again, except for windows and doors) prevents thermal bridging. Thermal bridging, in the context of structures, is when heat conducts through structural members, bypassing insulation. 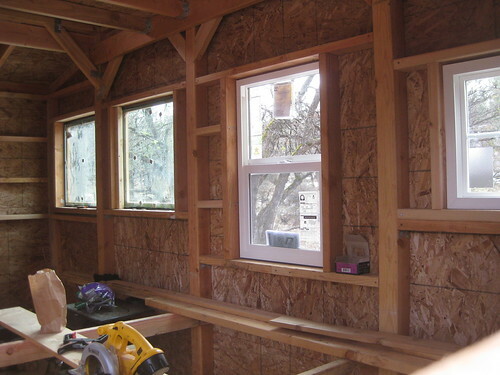 For instance, in a traditional 2×4 stud wall construction, only the space between studs typically have insulation, so the studs themselves can conduct heat in or out. While that may not seem like much, if studs are spaced 16″ apart, that’s 1.5″ out of every 16″, or close to 10% of the surface area that’s left uninsulated. When I first thought of the idea, I thought it was all new and radical, but I’ve since learned that this exterior insulation thing is… well, a thing. 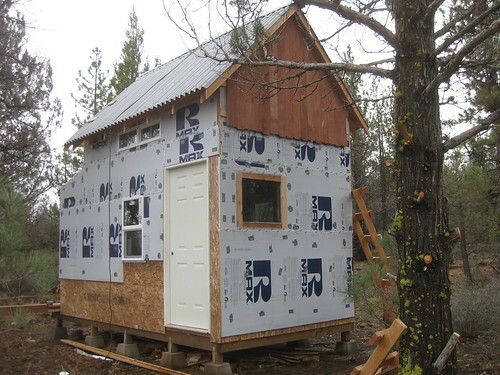 For instance, a related and somewhat similar concept is SIP –or Structured Insulated Panel— construction, which is a fancy way to say “insulation boards sandwiched between structural sheathing.” The one interesting thing about SIP is that the insulation boards are glued to the sheathing, thus increasing rigidity and eliminating any gaps. Gaps in insulation are bad, because it could allow for air circulation, which can render insulation moot by carrying heat in or out. For Hut 2.1, I originally tried using a spray-on glue to attach the polyiso boards to the underlying OSB sheathing, but the glue I got didn’t stick too well. So, instead, I’ve been nailing the boards onto the sheathing, and, where possible, through to the 4×4 posts (the gray patches of duct tape in the photo above are where I’ve put in nails). That doesn’t eliminate the gaps, but, in my case, I’m not terribly concerned because those gaps will be inside the thermal envelope, and as I mentioned above, the foam boards should, in theory, form a mostly air-tight enclosure and relatively little of that heat should escape outside. For the floor, I’m thinking of doing something different as well. Normally, batt insulation would be stuffed in the spaces between the floor joists. 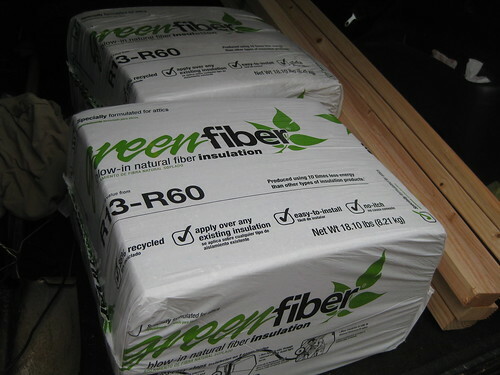 But, I don’t like fiberglass, and ever since I saw those cubes of recycled cellulose blow-in insulation at the hardware store (pictured below), I’ve been wanting to use them. The stuff is made of recycled materials, supposedly uses far less energy to manufacture than traditional alternatives, and is pretty cheap ($8 per bag), so it sounds pretty awesome all around. The current plan is to lay down more 2×4 “joists” on top of the existing floor (though running perpendicularly to the existing joists for strength), then put another layer of OSB on top of that, and fill in the 3.5″ tall gaps with the blow-in insulation, which should give me about R-13. Since the insulation will be sandwiched between two layers of OSB, I also won’t have to worry (as much) about critters getting in there or stealing my insulation, which I hear are concerns for the more typical exposed under-the-floor batt insulation. So, that’s basically the plan so far. I’m considering getting some batt insulation that’s made of recycled materials, similar to the blow-in insulation I got, to stuff in between my rafters. But, I think I’ll hold off on that until I get my stove going, and see how well the existing insulation works (or doesn’t work). Then, I almost got myself killed on the way out today. It had started snowing heavily just as I was leaving. Though the temperature was a few degrees above freezing, the heavy sticky snow accumulated quickly, and by the time I made it a few miles down the paved county road, the pavement was covered in half an inch of slush. Coming out of a gentle right-hand turn, I felt the car sliding as I tried to straighten out. I turned the wheel farther to the left, then suddenly the tires caught traction, catapulting me into the opposing lane and towards the hillside. With the car’s slip indicator beeping rapidly and franticly –as if I didn’t notice what was happening– I gave full right rudder, as the car straightened out with the left wheels rumbling on the gravel shoulder off the opposing lane. I slid, straight, half on and half off the pavement, as the side half-off the pavement tried to pull me farther off to the left, while the front wheels tried desperately and futilely to pull me back on to the right. After what seemed like minutes, but probably no more than 3 seconds, the car finally shuddered to a halt. I quickly scooted back to my side of the road, and pulled over on the shoulder with the emergency lights blinking. It was a close call. I’d scraped a bush off the side of the road, and my laptop had flown off the passenger side seat where it had been charging contentedly, but there was no discernible damage to car, contents, or person. As I got back on the road, I reflected on what had happened. In my rush to get out before the snow got worse, I’d failed to notice the rapidly changing surface conditions — which had been wet, but not snowy, just a few minutes and a couple of miles prior. I was going way too fast for the conditions. The treads on my front tire are also worn down almost to nothing (need to get new tires, or at least rotate the back tires forward). I’d also braked too hard, though I’m not sure what the car’s fancy electronic safety systems were doing during that whole ordeal. I was also fortunate there was no oncoming traffic — that could’ve ended catastrophically. Conditions got better as I got down into the valley, with the snow turning to sleet, then rain. But to get out of the area, I still had to go over a mountain pass at 4300ft elevation. There was at least an inch or two of accumulation on the road surface, with heavy snow falling steadily. I thought about waiting for a plough to come through and following it, but it was 3pm –an hour before sunset– with the thermometer showing 34F. That close to dusk, it’d get colder soon, and then icy. I decided to just take it slowly. Fortunately I made it up over the pass and back down to less snowy conditions without having to pull out my chains. Normally, I’d just wait out a storm, since I have plenty of supplies, and usually, nowhere to be. But, I’m heading out of town in a few days to go spend the holidays with my parents, so I was actually on a schedule for once. It looks like I got out just in the nick of time, other than that brief sledding adventure. So, that’s it from Serenity Valley for 2010. I’ll be back in January, but rest assured, I have blog posts lined up for the interim period as well. I also have a big-ish announcement possibly coming up, so stay tuned for that as well. I felt like making a quick video of Hut 2.1, so here it is. It’s not a terribly exciting video, and I wasn’t feeling particularly perky that day, but I figured it might still be of interest to some of you. You can watch it below, or in HD on YouTube. I’ll be honest, money is tight. I returned hundreds of dollars worth of chimney for a refund, and sold a couple of guns I don’t need. Combined, that raised enough cash to get me through the month. Next month, I’m planning on taking out an early disbursement from my 401k account. Obviously, that’s not ideal, but I’d rather do that than go back to the cubicle farm. But once that’s gone, and I haven’t come up with a better plan, the cubicle farm it’ll have to be. I want to keep doing what I’m doing. I want to keep living off the beaten path. And I want to keep blogging, to share my story and the lessons I’m learning. Obviously, I haven’t figured everything out. But life’s short, and I’m not going to waste my days doing something I don’t care about. If you can, please help. 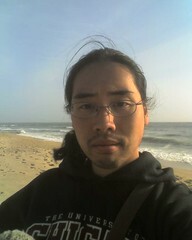 I found a coupon code for Lulu (which makes my calendars) to get free ground shipping. The coupon says it’s only valid through 12/12, but I was able to use it right now, and saved over $10 on shipping. The code probably won’t work for much longer, so if you were thinking of buying one of my calendars, you might want to take advantage of this offer soon, and try entering the code HOLIDAY305 on checkout. Update: That code might not work anymore, but reader Typhanee graciously shared a new coupon code she received when she bought a calendar: try entering RESOLVE355 to get another 15% off. I got all four windows up on the south-facing wall over the past few days, so Hut 2.1 is almost entirely enclosed. Once I put up one more window on the western side, it’ll be completely enclosed. There’s actually still one more window to put up, but where that’s supposed to go (the eastern side) is currently covered up in OSB, and I’ll need to cut out the opening (there was a last minute change in window locations). Few of my windows actually match, but that’s what happens when you go cheap. Of the 7 windows in the lower level, only 2 were bought new. Two more were bought in like-new condition from a salvage shop, but didn’t come with installation instructions, which would’ve been useful seeing how they don’t have tabs, unlike all the other vinyl windows I’ve seen. The remaining 3 windows I got from a friends’ dad, who’d rescued them from the dumper at a construction site. They’re actually really nice Low-E, double-paned argon-filled tempered glass that must cost a lot new, but only cost me a six pack of beer. They’re also unframed panes, but I improvised a frame, so we’ll see how that goes (yes, lots of weather proofing strips, caulk, and foam were involved).